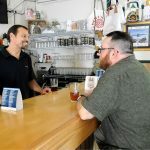 The second annual Greensburg Craft Beer Week is set for September 21-29 and will feature multiple events in the 15601 area during the 9 day celebration of craft beer and the Greensburg community. Extended 3 days this year, organizers are hoping for even more events than the 37 scheduled last year and increased participation from businesses, bars and restaurants who didn’t have a chance to host an event in 2017. “This year we are thrilled to partner with additional local businesses and offer a longer event time frame,” said Jenn Weir, one of the founders and organizers of the week. New for this year will be a Collaboration Beer Tasting and Home Brew Competition held on Sunday, September 23, information for interested home brewers will be released in the coming months. Another new event is an Unofficial Kickoff Party at Yellow Bridge Brewing on Thursday, September 20. Last year events ranged from beer dinners, to non profit fundraisers, to beer pairings with deserts and chocolates to various beer tastings. This year, coming up with events craft beer drinkers have never seen before is one of the goals for everyone. More information about this year’s events will be released on the Greensburg Craft Beer Week website, www.greensburgcraftbeerweek.com, on August 21, 2018. Sponsorship information is currently available on the site and by emailing greensburgcbw@gmail.com.